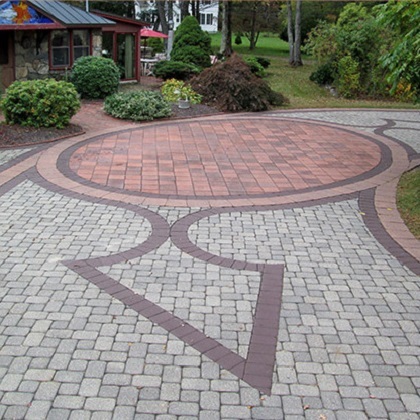 We build very decorative, curvy, walks out of pavers, fieldstones, and many more types. May be accented with many different colors. We build very decorative, curvy, walkways. 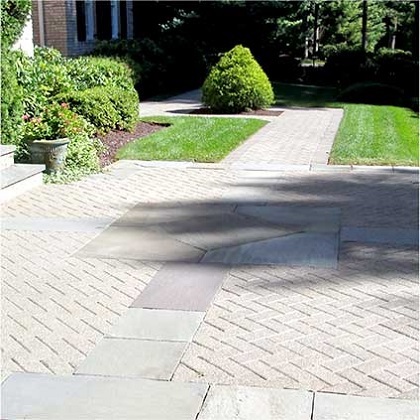 Out of rectangular bluestones, irregular bluestones, lilac brownstone, quartzite, bricks, cement pavers, granite. May be accented with many different materials in different colors. 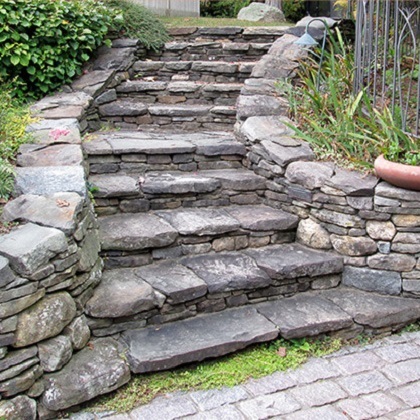 We build a huge amount of bluestone tread steps, with stone risers often times fieldstone, granite, quartzite, cemented, out of large monolithic piece of granite, bluestone, or brownstone. We build very decorative same as sidewalks for materials. All shapes and sizes. All shapes and sizes, accented with different materials. Mostly done in cement pavers or cobblestones. We accent much of our work with decorative pieces. Such as pillars with caps. We are also able to hide wiring and mechanisms within them. As the owner of Stone Man Masonry Company, I would like to thank you for considering us for your special project. I will be happy to help you with my creative input in assessing the job. I can show you an extensive portfolio of completed projects and bring samples that may pertain to your requirements. The design process, sketching, and estimating are provided free of charge. This special service is not without cost to me, so please give careful considceration to our proposal. I am present on every job and I personally oversee the progress. You have my personal guarantee of satisfaction. You will make a wise decision in choosing the quality and reliability we offer. The value of each project is determined by the cost of materials, usually a third of the total, plus labor and overhead. Our men work in a dangerous environment with heavy, jagged rocks and power tools. These circumstances have a direct effect on the cost of labor. Our trade has one of the absolute highest worker's compensation rates in the construction business. Our trucks must haul a massive amount of weight, therefore, they are not made for fuel efficiency. 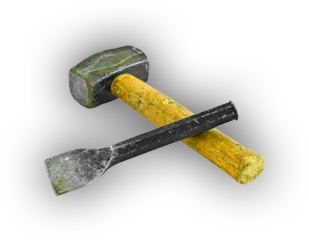 Furthermore, our equipment must withstand a beating that only stone give. Our administrative costs and taxes are also factored into our overhead. Our growing list of clients is a testament to the value and service we provide. Once the scope of the project is determined, designs and estimates approved, the job is scheduled. A one-third deposit is requested upon arrival of the materials. At 50% completion, an additional one-third payment is required to cover the costs of any labor having been done. The last one-third payment is due upon completion. Special arrangements other than those outlined above must be agreed upon in writing prior to the commencement of any work. The peace poll is a fourteen foot high, five sided copper poll with a short prayer for peace in ten languages that is going to be erected on the corner of East Hill road and Symons avenue at the park in Canton, Ct. The peace poll committee was seeking donations for two curving sidewalks, a patio, two park benches, a mall wall and peace poll for the middle. Jim called the commitee to see who was going to do the paving and ended up donating all the materials and labor for the sidewalks and wall. 2007 - Canton Fire Dept. Jim's nephew, a volunteer firefighter for Canton, mentioned on several occassions that the town needed a new ambulance, but lacked the budget to purchase one. Jim met with emergency officials in Canton and offered to donate a third of the amount needed and to run a fund raiser to get the remaining amount. The proposal was accepted and Jim set off to raise $110,000 for a new ambulance.Jim has successfully raised $140,000 and the ambulance has been ordered. Over 400 local businesses and individuals participated. 2004 - Canton Fire Dept. The Canton Fire Department requested a quote to build a wall in front of the fire department for a planter and flag in dedication to firemen who lost their lives in the line of duty. Since many family members of Jim's family have been firemen, he donated the labor and materials as a token of his appreciation to all the men and women who risk their lives daily. 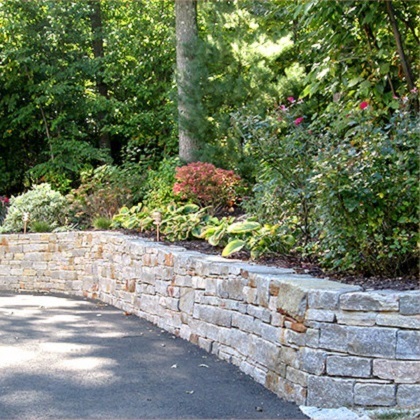 The Auer Farm in Bloomfield, CT requested a quote for a stone wall to be built. Auer Farm is a place where inner city children come to view and experience farm life as they have never seen before. It is a working farm which was in part donated to the non-profit in 1976 by the family of Beatrice Fox Auerbach, owner of G. Fox and Co, who created the farm as a premier dairy, poultry and apple farm in the mid 20th Century. Jim donated all of the materials and labor necessarry to build the wall. The Gerital Swingers Club is a golf club comprised of gentlemen who are WW II veteranss. The club is located at Orchil Farms Recreational Center, which is owned by the town of Simsbury. In 1973, Jim helped work on the dam at the 17th hole which was deteriorating over time. The club called Jim for a quote to face the dam with Brownstone and repair the the spill-way and build a concrete bridge over it at the 17th hole. Jim recommended the addition of stone walls and pillars on the bridge to go over the spill-way. This project was in dedication to veterans who lost their lives during the Vietnam War. The total amount was for the project was $34,000, and Jim donated half the labor, materials and completed the project. Jim's passion for stone architecture has led him on incredible travels. He has traveled the world in search of ruins and structures that speak about the past through stone. Peru - spent two months in Peru to visit ancient stone work at Machupichu and other ancient Inca sites. Europe - many trips to see Roman ruins all over Europe. From Greece to Ireland, England, Scotland, Wales. Spent a lot of time visitng Viking settlements, fortresses, castles, & aqueducts. Visited stone quarries and studied different types of stone used throughout the Roman and Medieval periods, and also some pre-Roman structures such as Stonehendge. Also visited Santorini, Crete, Andros, and Delos. Mexico - spent 2 months visiting all the Mayan, Toltec, Aztec pyramids and ruins all over the country. Australia - visited aboriginal rock shelters in the far northeast. Stone Man Masonry Company is a high quality professional contractor which has built an excellent reputation in residential and commercial masonry since 1974. 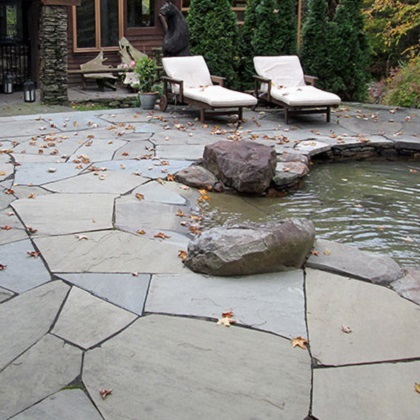 We use the best materials available and combine that with our skilled workmanship to create a most enduring product. Our reliability has helped bring us enough work to fill our seasonal schedule; usually March through December. Our growth has increased our capabilities, and we now can move hundreds of tones of material to over one hundred jobs per year smoothly using a small fleet of trucks and several full-time assistants. You can expect to see what initially is a collections of rough materials become masterpieces of the mason's art. Our hard working men perform this task in the safest, most responsible fashion with the aid of latest technology as well as age-old methods. Your property will be respected in every way possible, minimizing damage to your valuable lawn and garden. We are fully insured for your complete protection and peace of mind.